Hanami literally means 'flower viewing'. The cherry blossoms (sakura) are believed to exemplify the transient nature of life because of their short blooming times. It takes about a week or 2 , to see the flowers in bloom. Japan actually even gives forecasts when and where sakuras are to be in bloom. 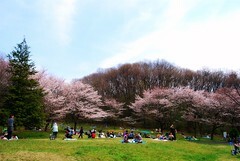 During hanami period, the Japanese go to parks, lay down their mats and drink sake under the sakura trees. ScIoN is a former Systems Engineer in Japan who specialized in industrial imaging and digital hardware design. He is now back in the Philippines pursuing graduate studies in Finance at the University of the Philippines - Diliman. Have Some Fun While You're At It!